Understanding Build commenced... - jxeeno blog. At the end of October, NBN Co changed the way they marked the start of an NBN area's construction. 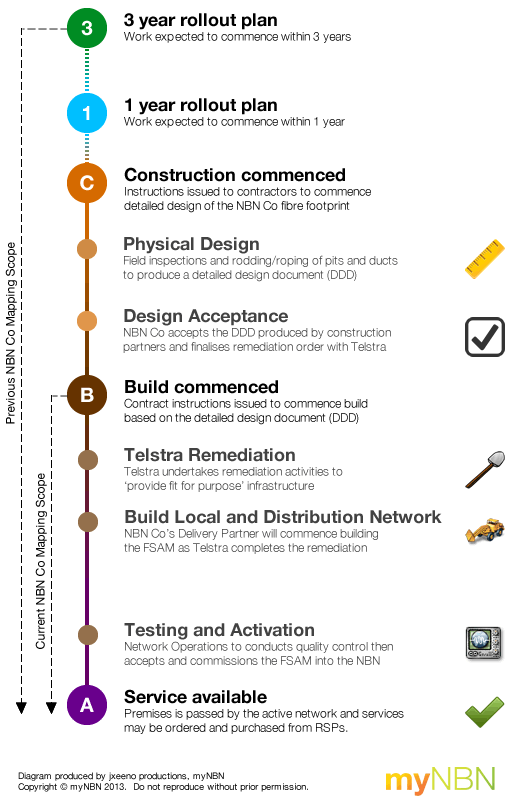 Previously, NBN Co started plotting physical network boundaries for areas where "Construction commenced" — while now, only areas where "Build commenced" are defined. For the purpose of this post, I will be referring to the "Construction commenced" and "Build commenced" definitions as being metrics. Both definitions were readily available on the NBN Co rollout map during each metric's use on the Rollout Map. I've created a table with the two definitions at the bottom of this section — but this is a more detailed and digestible graphic. *new* Build commenced Build commenced means that NBN Co has issued contract instructions to construction partners so they can commence work in this area. The build commenced boundaries are subject to change as a result of boundary changes which may be made during the construction process. […] NBN Co should continue existing construction where build instructions have been issued to delivery partners. Any further build or remediation instructions should not ordinarily be issued pending further analysis and discussion. Neither metrics are more accurate than the other. Both metrics provide indication of a certain stage of construction, or the lifecycle of an FSAM (Fibre Serving Area Module). Both metrics are clearly explained and detailed on the map itself, and so… it follows and is "consistent with a standard". So for anyone who actually bothered to read the map (now, and before) — it wouldn't be too hard to understand what each means. False. The new metric is in no way more precise. In fact, the current map is arguably less precise than the previous map because the future of the NBN is dependent on the Strategic Review currently being conducted. I think the key here is the detail. The current map provides reduces the amount of detail on the map. Essentially, any fieldwork conducted by a contractor prior to the issuance of the build contract instruction is regarded as being non-existent on the map. You'd be kidding me to say that rodding/roping and pit/duct inspection is not physical work. However, I wouldn't call either metrics as being detailed. The "construction commenced" metric is not detailed, but covers a wider range or period. The new "build commenced" metric disregards any field work prior to the issuance of the build contract instruction, but doesn't provide any further details. Sure, it'll take more manpower to do it. However, even if one or two of those statuses are reported… it would improve the overall transparency of the map. Claim: It shows areas FTTP has been removed! False. We don't know what the result of the strategic review at NBN Co will tell us. Government directives will push for a more mixed-technology based approach, employing FTTN technologies rather than FTTP in some areas. But what actually happens will depend on the result of the strategic review and subsequent renegotiations with Telstra. Basically, we don't know who won't get FTTP. If you're not on the map, it doesn't mean you won't get FTTP — it simply means that NBN Co and the Government have yet commit contract instructions to build your area. False. Unlike what some politicians have asserted, the new metric shows areas where work to build the Local and Distribution Network of the FSAM can commence. It indicates that NBN Co has approved the Detailed Design Document (or the detailed network design) and that the construction partners can start rolling out the fibre at any time. Malcolm Turnbull: It’s when the construction contract is signed with the particular contractor for a specific area. And yes, the shovel will hit the dirt, as it were, immediately thereafter. When those contracts were initially signed around June, there was no capacity for construction in Taree. The majority of the contractors were still held up further north in Coffs Harbour, where construction is still ongoing. It was not until early November when ducting and fibre started hauling in 2TEE-04. In fact, 2TEE-02 is not slated for completion until September 2014. Build commenced means that NBN Co has issued contract instructions to construction partners so they can commence work in this area. The maps did cause widespread panic. And it's justifiable panic considering the sudden removal of over 60% of areas. A more appropriate move for NBN Co would have created two sets of shading: "Awaiting review" for areas where it was previously marked as "Construction commenced" as well as the new "Build commenced" metric. This would have alleviated some of the anger and confusion… to some extent. There's still a lot of room for improvement. Realistically, NBN Co needs to improve its overall transparency… while we do get new statistics, a significantly substantial amount of public data has actually been removed. Malcolm needs to live up to his election promise of a more transparent NBN Co. From all I can see, transparency has overall decreased so far. But that's for another post, for another day.